Launched in 2013, the European Structural and Investment Funds Journal (EStIF) responds to the growing need for information exchange between the various stakeholders involved in the implementation of ESI Funds. The journal deals with all aspects of the management, implementation and control of the European Regional Development Fund, the European Social Fund, the Cohesion Fund, the European Agricultural Fund for Rural Development and the European Maritime and Fisheries Fund. EStIF offers a platform for hands-on expertise in structural policy and encourages knowledge exchange between European institutions and national and regional authorities in the field of ESI Funds. best practices and experiences of Member States & beneficiaries. EStIF addresses public authorities involved in the management of ERDF, ESF, CF, EARDF and EFMF programmes, such as Managing Authorities, Certifying Authorities, Audit Authorities, and Intermediate Bodies, as well as other authorities involved in the management and implementation of EU funded projects, such as EU Funds and European Affairs Departments in national and regional ministries, agencies and governments, cities and local authorities implementing EU funded projects, and national and regional development agencies. Furthermore EstIF’s target audience are other beneficiaries of EU funded projects, such as private and public companies, NGOs, associations, research institutes, bodies working on European Territorial Cooperation and INTERREG Programmes, public and private banks and other financial intermediaries, consultants and lawyers involved in projects containing European funding. Published on a quarterly basis under the guidance of distinguished Editors, EStIF combines articles from EU Funds specialists, best practices as well as first-hand experiences from Member States and beneficiaries. Articles focus on upcoming changes, introduction and implementation of new regulations or look back on specific problems and solutions including check lists, templates and other useful information for practitioners. Country reports shed light on the stage of implementation in the Member States. In 2018 each issue focuses on one specific topic such as financial management, cohesion policy post 2020, e-cohesion and first experiences of the assurance package. General articles, interviews or conference reports complement the edition. 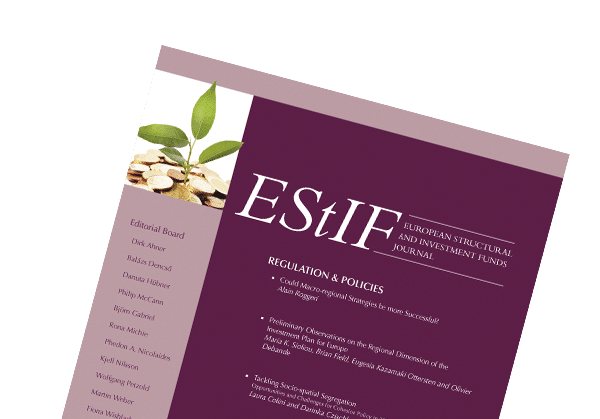 The new issue of EStIF is a special issue focusing the use of financial instruments within European Structural and Investment Funds programmes. Although these currently only account for a minority of spend under the programmes (most still being implemented mainly through grants), the role and implementation of financial instruments has been much debated over the last two programming periods. With the future shape of Cohesion policy currently under debate, financial instruments are likely to continue to play an increasing role in the implementation of Cohesion policy in future, both at shared management and EU-levels. We hope that the extensive collection of articles along with the series of interviews featured in this issue contribute to the discussion on the potential future role of financial instruments. For the beginning of 2018, guest editor Arno van der Zwet has put together a special issue devoted to the use of integrated place-based approaches within ESIF programmes. The articles are based on the findings of a study of the European Policies Research Centre conducted on behalf of the European Commission. Its aim was to analyse the implementation of the integrated place-based strategies within sustainable urban development. Besides two articles, five country specific reports provide an overview of the implementation and a specific example of a strategy in that country - Czech Republic, Finland, Greece, Poland, UK. On a related theme, one further article discusses the contribution EU Cohesion Policy has made to supporting territorial development strategies in Portugal. View all articles of issue EStIF 1/2018. The advertising prices are valid from January 2019. Please provide the advert in a PDF-X-1a format + 3 mm bleed (without crop marks). Become an author for EStIF and view our Call for Papers. Spontaneous contributions are welcome and should be sent to the Executive Editor Clara Hausin or Juliana Veit. Only submissions of excellent quality will be accepted in EStIF. Responsibility of the factual accuracy of a paper rests entirely with the author. All publications must clearly distinguish themselves from the status quo of discussions – in particular through sufficiently broad publication footnoting and referencing – and provide an added value to those discussions. Contributions should not have been published, nor be pending publication elsewhere. After the manuscript is submitted, it will undergo a process of peer review for accuracy, quality and relevance. Submission of a manuscript does not imply claim for publication. Optionally before submitting a manuscript, the editors may be contacted regarding the suitability of a given topic for EStIF. Every word in the title should be capitalised except for conjunctions (Headline Capitalisation). The title’s length should not exceed three lines after typeset (max. 150 characters including spaces).Subtitles are allowed and should also not exceed the 3 lines rule (max. 200 characters including spaces).Authors’ details Author(s) details should be included in a first asterisk footnote (*) inserted after the author’s/authors name(s).Example:Article TitleDavid Freestone*___* Prof David Freestone, Lobingier Visiting Professor of Comparative Law and Jurisprudence,George Washington University Law School. For correspondence: <dfreestone@law.gwu.edu>To do so: In the References ribbon tab, click the Footnotes launcher (lower right corner in the Footnotes section). There, place an asterisk into the Custom mark: box, then click Insert, and type your footnote text.All further footnotes should be numbered sequentially in superscript in the text outside punctuation marks.